ChronoSync can easily be configured to perform bidirectional synchronization between two computers that have a direct or network connection between them. But what if the two computers are not in the same physical location and there is no network connection available to synchronize them? The solution is to synchronize with an intermediary. An intermediary simply refers to a common location that itself gets transported between the two devices. It can be a portable hard drive, thumb drive or even an iPhone. This guide explains how this can be accomplished. This guide will present two options to use as an intermediary. The first will be a USB flash drive (aka "thumb drive") and the second will use an iPhone running InterConneX. There are many other devices that can be used as an intermediary such as portable hard drives or even a laptop computer. The process will be nearly identical for them. The first step in using a flash drive is acquiring one. USB flash drives are commonly available in capacities ranging from 4GB to 256GB, all at very affordable prices. Choose a capacity that will comfortably handle the amount of data you would like to transfer. We recommend choosing a size at least double what you think the maximum size you need is. We live in the age of "big data" — that extra capacity will not be wasted! Once a flash drive has been acquired, you must give consideration to re-formatting it. Most flash drives will come pre-formatted with the MS-DOS (FAT32) file system. 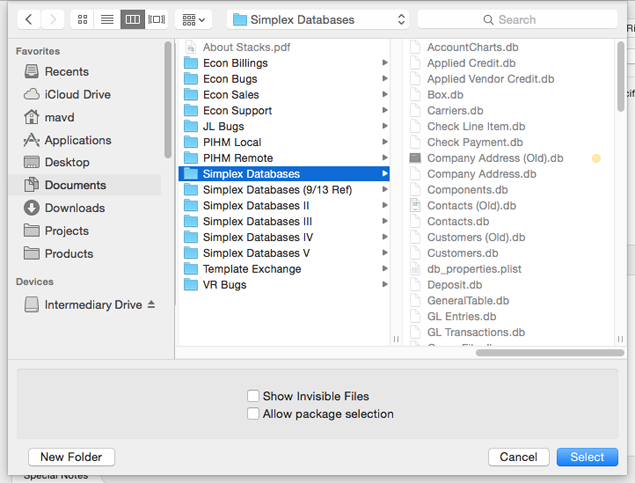 Your Mac can read and write to this file system but it is not the most efficient way to store Mac documents and data files. Specifically, there will be limits on characters that can be used in filenames. Certain types of file attributes cannot be efficiently stored there, either. Unless you want to retain the ability to use this flash drive on a Windows PC, you should reformat it with a Mac native file system. 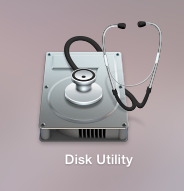 Once you launch Disk Utility, all the attached drives will be listed in the sidebar on the left. 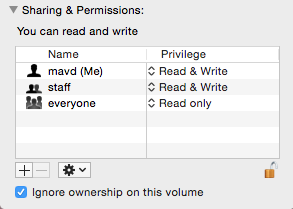 Each drive will be listed as a device and any volumes on the drive will be listed as sub-entries for that device. A volume equates to a partition on the drive and represents a portion of the drive that has been allocated to exist as a separate, logical disk. A single hard drive can be partitioned into many volumes, each acting as a separate, independent disk. To use a flash drive as an intermediary, select it from the device list on the left. Be careful to choose your flash drive and not one of the other storage devices! You will then need to partition it. 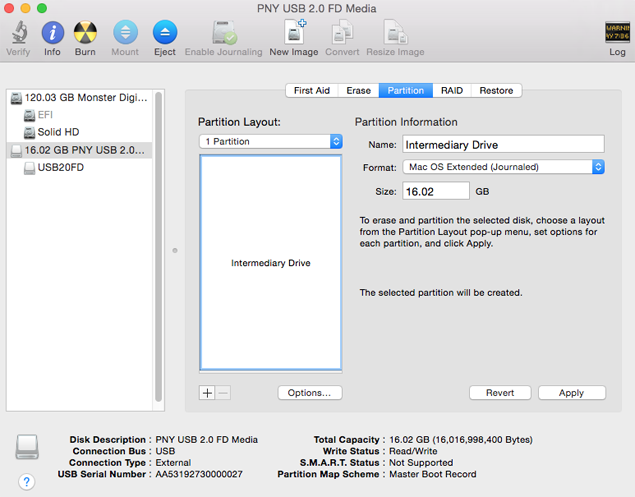 A single partition is all that is necessary. You have the option to create additional partitions depending on your needs. For this guide we will choose "1 partition" and name it "Intermediary Drive." After choosing the Partition Layout and supplying a name for the drive, choose "macOS Extended (Journaled)" from the "Format" popup menu. You can now click the "Apply" button and wait for the partitioning to complete. It should take just a few moments. Note: If you are performing this operation on a portable hard drive instead of a flash drive, the operating system is going to step in and ask if you want to use this drive for Time Machine backups. You don't want this so just say "No." Your flash drive is now formatted and ready to be used as an intermediary. You can now skip ahead to CREATE THE FIRST SYNCHRONIZER DOCUMENT. There are several pieces of software that you can use to store files on your iPhone or iPad. This guide is going to focus on using InterConneX. It is the most awesome of all your choices and it happens to be FREE. To acquire InterConneX, just open the App Store on your device and search for InterConneX — or just follow this link. Download it and install it on your device. With InterConneX installed, go ahead and launch it. 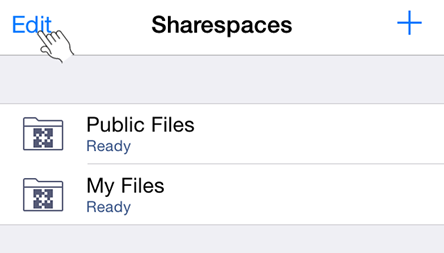 Two sharespaces are created for you automatically, "My Files" and "Public Files." Think of sharespaces as mini hard drives that are stored on your device. The "Public Files" sharespace is already configured to be accessed over local Wi-Fi so that is what we will use in this guide. It is only 100 MB in size, however. If this is not large enough to serve as your intermediary, you are going to have to resize it. Note: sharespaces can be resized at any time without affecting the files stored in them, so you only need to make sure the sharespace is large enough for your current needs. You can increase it later as your needs grow. Select the desired storage capacity from the list that follows then save your selection. More information on configuring a sharespace for sharing can be found in the "Sharing With Others" document (iPad | iPhone) that is included with InterConneX. The next step is to configure ChronoSync to connect to this sharespace. To do this, launch ChronoSync and then select "Preferences" from the "ChronoSync" application menu. When the "Preferences" dialog window opens, choose "Connections" in the toolbar. You must now create a connection profile. A connection profile simply remembers information about the device you are connecting to and the credentials necessary to access it. Once created, it can be re-used over and over again, making future connections quick and easy. Click the "+" icon at the top right of the connection profile list. The Connection Profile Editor will appear. Note: at this point, make sure that InterConneX is running on your device and that both your device and Mac have connected to the same wireless network. Specify a unique name in the "Profile Name" field. Usually this describes the device but it can be anything you'd like. Next, your iPhone or iPad should be visible in the "Connect to:" popup. Go ahead and select it. By default, the "Public Files" sharespace in InterConneX does not require credentials to access it. If you did not change this configuration, just choose "Guest." If you did reconfigure the sharespace to require a username and password to access it, specify them in the "Username" and "Password" fields. In either case, go ahead and click "Test" to make sure everything is working. If your settings are valid, just keep clicking "Next" at the bottom right of the editor and then "Save" your connection profile. You are now ready to use this sharespace as an intermediary. Proceed to the next section to configure ChronoSync to work with it. In this guide, we're dealing with two hypothetical Mac computers, "Computer A" and "Computer B". These computers are not connected in any way and in fact may be separated by a great distance. Hence the need to synchronize via an intermediary. As part of the process, we will create a synchronizer document on each computer. This step deals with creating the first synchronizer document on "Computer A." Begin by launching ChronoSync and, when the Document Organizer window appears, click "Create new synchronizer document." A new synchronizer document window will appear and you will be asked to supply a name. Supply something meaningful that describes the task such as "Sync With Intermediary." A "Synchronize Bidirectional" operation signifies that we will merge the files on the left target with the files on the right target. The end result is an identical set of files in both targets. Once configured and run, any modified files on the left target will get copied to the right target and vice versa. Logically, the next step is to specify what the left and right targets are. We do this by first clicking "Choose…" in the "Left Target" pane. Here we are choosing the folder on "Computer A" that we would like to synchronize with the intermediary and, ultimately, "Computer B." The next step is to specify the right target, which will reside on the intermediary. The steps we take depend on whether or not we are using a flash drive or an iOS device running InterConneX as our intermediary. If using a flash drive, simply click "Choose…" from the right target information sub-pane. When selecting the right target, click on your flash drive in the list of "Devices" in the sidebar. 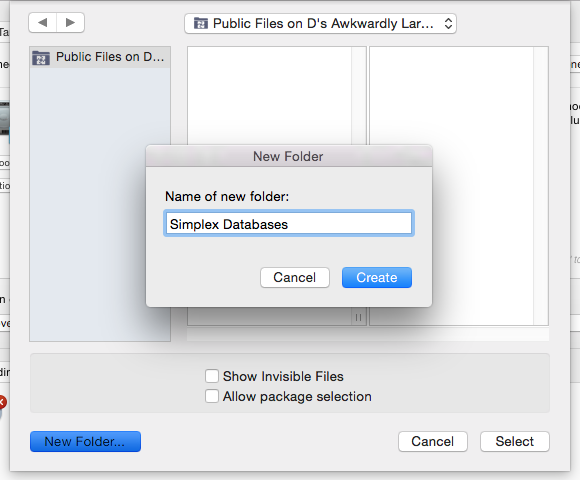 Then create a folder on the intermediary by clicking "New Folder." This is not strictly necessary but is the accepted common practice. It will keep the data better organized. Plus, if you did not reformat, the drive may have come pre-formatted with a filesystem that has difficulty handling a large number of files at the root level. A sub-folder circumvents that potential problem. If using an iOS device with InterConneX, first select the name of the connection profile you created from the "Connect to:" popup menu in the right target info sub-pane. Make sure that InterConneX is running on your iOS device and that it has connected to the same wireless network as your Mac. Once a connection is established with your iOS device, simply click "Choose…" from the right target information sub-pane. As with the flash drive, when selecting the right target, create a folder on the intermediary by clicking "New Folder." This is not strictly necessary but is the accepted common practice. It will keep the data better organized. Everything is set to go at this point and you certainly may proceed to run your initial bidirectional synchronization. However, there’s a few options that you might want to consider. When enabled, this option will detect a deleted file on one side of the sync and perform the deletion on the opposing side. This is what you should choose if you truly want to keep both sets of files identical to each other. If enabled, however, we recommend keeping the default "Move to Archive" option under the "When deleting files" heading. This will place any deleted file in the synchronizer's archive, allowing it to be recovered at a later date if you discover the deletion was in error. This option is also staring you in the face in the Setup Panel. When enabled, it will move any files that get replaced as a result of the synchronization into the synchronizer's archive, allowing it to be recovered at a later date. This is a handy option because not all modifications to a file are improvements. Also, since this is a bidirectional synchronization, you may occasionally get conflicts when a modification is detected on both sides of the sync. When resolving the conflict, you may inadvertently chose the wrong file to get copied. Archiving replacements ensures that you can get that old file back! The "Attempt to mount volume" option is ON by default for all removable media. You should keep it ON. If you run this synchronization without the flash drive mounted, a prompt alert will appear asking you to insert the media. 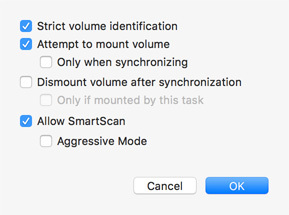 The "Dismount volume after synchronization" option is OFF by default. You might want to turn this ON so that when synchronization is complete, the flash drive will be unmounted and you can physically unplug it from you computer without fear of corrupting the data on it. You can then transport it to "Computer B." At this point, all your synchronizer document settings have been specified and the desired options chosen. You are now ready to run the synchronizer document! To do this, click the "Synchronize" button in the toolbar, or click the big circular button beneath the "Operation" popup menu in the Setup Panel. The first bidirectional synchronization operation that you run will take the longest time. After that, only modified files will have to be copied so it will run much quicker. When complete, you may close the synchronizer document and transport your flash drive or iPhone to "Computer B" to perform the next step. Note: if using a flash drive, make sure it is safe to unplug the device by first ejecting it via Finder. You do this by clicking the Eject icon that appears next to the flash drive device in a Finder window's sidebar. When the device disappears from the sidebar, it is safe to unplug. If you configured your synchronizer document to automatically eject the media, you don't have to worry about this! If you are using an iOS device as an intermediary, you will need to create a connection profile on "Computer B" identical to the one created in the IPHONE OR IPAD section. When naming the synchronizer document, you can choose the same name you specified on "Computer A." Since they are different computers, there is no problem choosing the same name. Or you can choose whatever other name you'd like. You do not need to create a folder on the intermediary since you already did that. However, if you don't already have a folder on "Computer B" that you want to synchronize with, you will need to create it. When the second synchronizer document has been created, you can go ahead and run it. All the documents on the intermediary will be synchronized with the local folder on "Computer B." Since you need to synchronize every time you switch Macs, it is not practical to schedule your Synchronizer document to run at a specific time. Instead, you generally will run the sync manually before you switch Macs. Doing this will take some getting used to, but it's a habit that should be practiced. You can partially automate the process, however, by taking advantage of the "Sync when available" scheduling options. To do this, you would select "Schedule…" from the "Actions" menu when editing your synchronizer document or just click the "Add to schedule…" icon in the toolbar. In the Scheduled Item Editor window that appears, choose "When a volume mounts" from the "Run" popup menu for a flash drive based sync, or "When an agent becomes available" for an InterConneX based sync. Then choose "Right target volume mounts" or "Right target agent becomes available", depending on whether this is a flash drive or InterConneX based sync, respectively. This will cause the bidirectional synchronization to run automatically whenever you insert the flash drive or launch InterConneX on your iPhone (while connected to the same network as your Mac). Just in case you might not want to always run this synchronization when you connect your device, turn ON the "Prompt user before running" checkbox when creating your scheduled item. This will display a prompt before running the bidirectional synchronization, just in case that isn't what you intended to do. Note: if you take advantage of the scheduling shortcut, you must create a scheduled item on both "Computer A" and "Computer B." When you leave work, make sure your flash drive is plugged in. Run the "Sync with Intermediary" synchronizer document. When you get home, plug in your flash drive. Do your work at home. When getting ready to leave home, run the "Sync with Intermediary" synchronizer document. When you get to work, plug in your flash drive. When getting ready to leave work, repeat this process from the beginning. When you leave work, launch InterConneX on your iPhone. Put your iPhone to sleep. When you get home, wake your iPhone and make sure InterConneX is running. When getting ready to leave home, wake your iPhone and make sure InterConneX is running. When you get to work, wake your iPhone and make sure InterConneX is running. As noted earlier in this guide, you can take advantage of "When available" scheduling so that your synchronizer document is automatically run whenever you plug in your drive or launch InterConneX. The only issue is that if you are using a flash drive and are wrapping up work, your drive is probably still plugged in. You will have to manually run the synchronizer document or unplug/replug-in the flash drive to trigger the sync. By default, when you formatted your flash drive as described above, it will get mounted with the "Ignore Ownership" setting enabled. This is what you want because preserving the macOS user/group model between two different computers is difficult to do. If you ever find that the "Ignore Ownership" setting has been turned off for your flash drive, select it in Finder and perform a "Get Info" operation. "Ignore Ownership" can be turned back on at the bottom of the "Get Info" window.